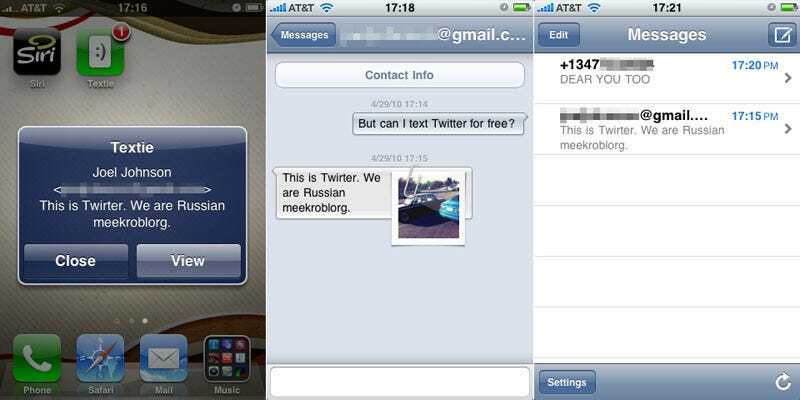 The guy behind recent Twitter purchase Tweetie, along with the dude behind Borange, have put together a characteristically pretty SMS replacement app called Textie. There are two things you should know about it: It's free, and it works. Textie texts just about any way you want it to, trading messages through email aliases between Textie clients (free), through phone numbers between Textie clients (free), between Textie and email clients (free), and between Textie and other phone numbers not associated with Textie apps. (Free for you, but possibly not for the other person in the conversation, who may incur regular texting charges.) The only carrier that doesn't play well with Textie is T-Mobile.